I feel confident in the concept, and I have been team teaching for a number of years. There are days when I don’t teach with other teachers, but there is always some valuable carryover in every situation where I find myself teaching. I mostly find team teaching to be incredibly valuable and use it often. Some who I teach with are regular partners, some are ad-hoc fill-ins, and some are very good hosts, who can bring added value to the presentation. It takes all types. My personal experience is that it just makes sense. I’d like to outline some of the reasons below to help you as you consider the idea to grow your training business or your participant base. Does every team member sometimes have to be the face of a company? They may be very good at other roles like range safety, explanation from a different perspective, or for helping to facilitate with documents or activities to make the class go smoother. Most importantly I have found that eyes on fingers and holsters during drills or practices are a big need. When I have another teacher there that knows what is needed, and can quickly mitigate unnecessary risks on the range, it’s very helpful – it’s much safer. Having an instructor with good knowledge that can help keep an eye out during private corporate events or larger classes, just makes good sense. You can rely on that person to make you look good by keeping concerns to a minimum and by recognizing issues before they manifest to the class. Sometimes it’s just about taking a bit of the stress or load off of you, as you are trying to cover a difficult topic. Having someone who can slot in and work with individuals as you lead the group is very helpful. Sometimes what I say doesn’t make sense to a specific shooter. The other teacher can easily step in and facilitate in getting the student to where they need to be. Under the Weather? Don’t cancel class, call in reinforcements. When I might be sick or unable to teach as normal, having another teacher to act as the spokesperson while I just provide oversight and assistance, makes my job easier and gives added value to my students. It may not be a sickness, but maybe something simple that requires your attention, while the other teacher can guide the class temporarily. I once had a class in Oklahoma and running an extended stay-over there - about 9 days in a row, and we were doing some defensive shooting classes in a loud indoor range. I just lost my voice after having to use it in an elevated way for 4-5 days. So here I am, halfway through the courses, and I can’t talk. If I hadn’t had a former student who I was confident in their skills, I would have been lost. The class would have been a disaster. He stepped up and helped me run the range verbally, I just needed to provide an outline and explain the transitions, and provide oversight as I watched him make the verbals to the class, he helped me run the actual commands in the class, and everyone was better for it. Got a difficult student? Asking a lot of questions, or who brought a substandard firearm, or someone who is creating a bit of difficulty with the broader class? Having a one-on-one with a bit of separation for the class makes a smoother class for everyone, and the bad behavior or misunderstandings from the difficult student seems to be much improved by giving the student some space and a bit of attention from that team teacher. Not only do you make your life easier, you make him a better shooter without alienating anyone. Different people connect to different people, differently. Sometimes success is as simple as that. From a practical perspective, having a credible representative that will vouch for you or will help get the class rolling properly because they know the class participants or the area/range/location. This is particularly useful as you get hosted in unfamiliar areas, as you grow your geographical footprint. This is very helpful as you get into the marketing and presentation of the upcoming event. Having a co-sponsor type team member can be invaluable. Sometimes you need people who have certifications that are state specific or those who have a particular specialty knowledge that you don’t excel in. Signatures on certification documents may be necessary for certain areas, that you are sponsored or credentialed in. Once when teaching out of state, I was not able to sign certificates due to a licensing requirement of that state, my teaching partner fulfilled that requirement as she was licensed in that state to do so. It just made sense for the specific instance. Not to mention she’s a great instructor to work with. Of course, when you are looking for teaching partners, we need to vet them heavily, whether formally or informally. It’s never a good time to find out that a team teaching companion isn’t top tier, when bullets are flying on the range or when you have new shooters that are concerned about certain aspects of the training. Having a well-vetted, capable teacher beside you can improve the current conditions and the later, word of mouth from students, exponentially. 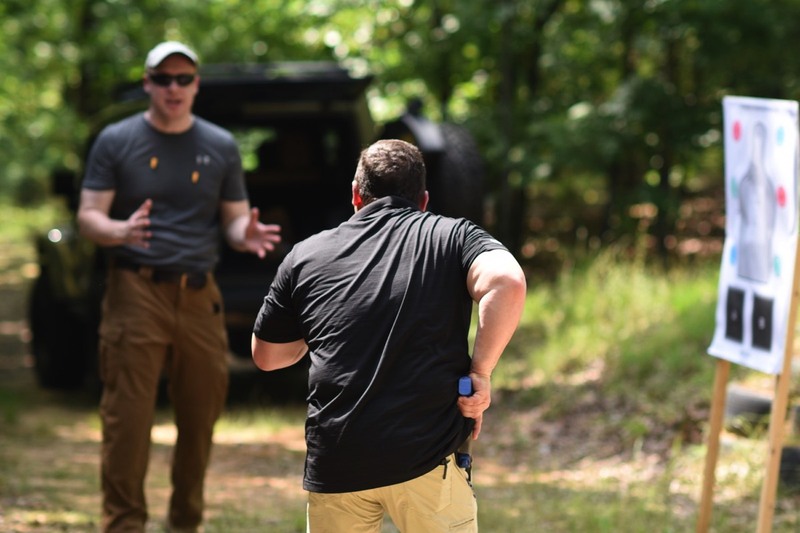 Providing a safe, enthralling, and comprehensive experience for shooters who are training with you can be the difference between another successful trip and a difficult growth phase for your business. I cannot stress the importance of the people you choose to help you represent your brand and to help other shooters improve their confidence enough. This leads to better safety understanding and proficiency with firearms or safety instruction. It’s a win-win for you and for students. Finding a good balance of team teachers is also crucial. Some people are just not the “front man” type. They just don’t enjoy being in front of a class, but one on one or for smaller breakouts, they are a great asset. When you have a pool of people who you can rely on to help facilitate all types of teaching instances, it makes your job much easier and builds good relationships with your students and those other teachers. Having a helper in a class can be super important. It helps take some of the monotony out of the class as you do drills. When they were younger with less experience, my sons were pretty much my range monkeys for several years - any time we did a class they were the ones out there with the staple gun hanging targets. They were team members, albeit low-paid team members, but they did get a lot experience and exposure and now both are instructors in their own right. Sometimes it's nice to have somebody on the back end to help out with administrative items. I get hosted frequently in other cities or even in other states and to perform whatever it is that they're wanting to do whether it's a church safety team training event or it's a defensive shooting event or some sort of a concealed carry instructor development event, I sometimes need help. To do all the necessary things to prepare for a new class, in an unfamiliar location and travel quite a bit to do it, at times it's nice that I might have somebody who's an ad hoc team member who I may not even know that well, to step up. Generally, I find they are very willing to help and I can use them for various things. They're sometimes the ones hosting me; I might be using them as resources to find facilities for me or to make sure that we have an adequate range to use to do what we need to do. For instance: if it's a defensive course we need to be make sure that we can move on the range and we can actually draw from the holster while moving. These types of tasks can be delegated to gracious hosts and it may even help to ask as you are structuring events. You will often find ad hoc team members among the group of people who are attending an event you have scheduled. They may help to make sure that if it's classroom or part time in a classroom or an auditorium in a church, that the specific needs are being met, and planned for. It’s important to facilitate that kind of conversation and to ask when you need to. Communication is key, and the onus is on you if you want to have a successful class. Having a team teacher or helper in this specific instance is crucial to providing the best experience to your new clientele. It’s a serious endeavor to try to work with the best people in the area and the benefit can (and should) be mutual. Part of what we do is a continual progression to getting better. We are constantly looking for ways to improve. Do whatever you can to ensure you are not only in compliance with the best practices as an instructor, but do the little, consistent things that will help you to get better as a trainer, as an individual, as a communicator; as a steward and advocate for safe, confident shooting. Having a mentor or a teacher you trust to help improve your own skills, whether it be in physical implementation aspects of the job, or if they can help you with public speaking, diagnosing shooter’s particular problems or just staying focused, this exercise can be invaluable. Don’t be afraid to receive critiques and constructive criticism yourself. Find somebody to mentor and find somebody that can mentor you: that's what the team training and the support is really all about - making people better; making instructors better. Team teaching will, a lot of the time, regardless of how good you already are, get you to the next level. Team teaching can bring you there.